The 2017 edition of the UK VFR Flight Guide is the biggest ever with over 525 airfields fully described – 400 more than some other UK flight guides – and additional basic listings for another 450 flying sites. With the clearest and most user-friendly, full colour airfield maps on average 40% larger than our closest competitor and the most comprehensive flight planning section, it’s no wonder that so many pilots make the UK VFR Flight Guide their No.1 choice. With only 130 licenced airfields in the UK AIP, the UK VFR Flight Guide is the UK's most comprehensive and trusted source of airfield data. 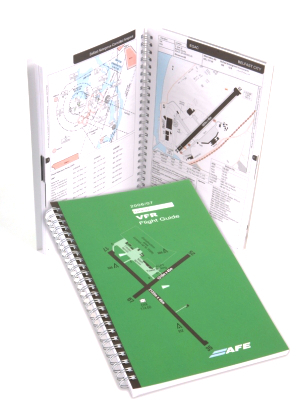 The UK VFR Flight Guide is available in a variety of formats - spiral bound, loose leaf pages and softback.